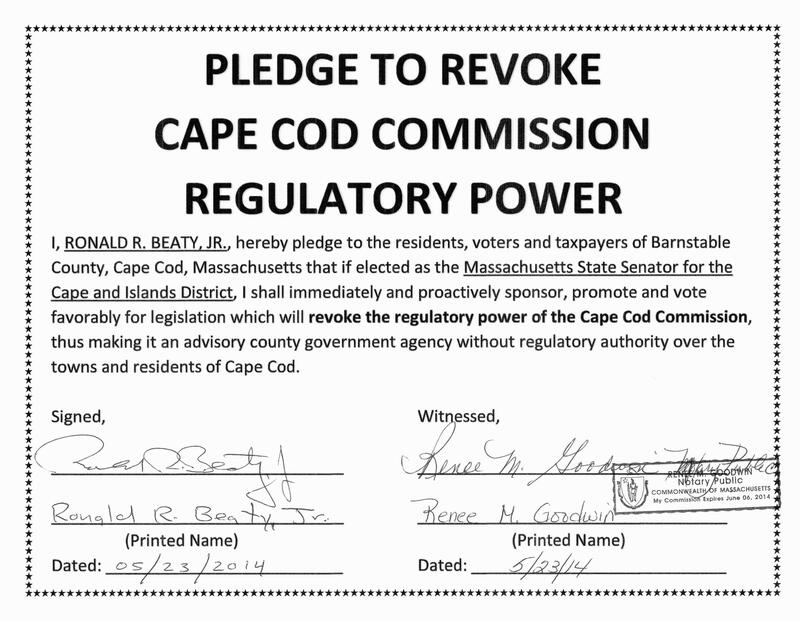 On May 23, 2014, Conservative Republican Cape & Islands State Senate Candidate, Ron Beaty, signed a formal document in which he pledged to the residents, voters and taxpayers of Barnstable County, Cape Cod, Massachusetts that if elected as the Massachusetts State Senator for the Cape and Islands District, he shall immediately and proactively sponsor, promote and vote favorably for legislation which will revoke the regulatory power of the Cape Cod Commission, thus making it an advisory county government agency without regulatory authority over the towns and residents of Cape Cod. This entry was posted in Barnstable County, Cape Cod Regional Government and tagged barnstable county, cape and islands, cape and islands district, cape cod, cape cod commission, conservative, conservative candidate, dan wolf, election, election 2014, massachusetts, massachusetts state senate, pledge, political candidate, regulatory power, republican, republican candidate, revoke, ron beaty, senate candidate, senator dan wolf, senator wolfe, state senate candidate, taxpayers, tea party, voters. Bookmark the permalink.